Pandit (master) Debashish Bhattacharya is one of the world’s most remarkable slide guitarists and this album represents the culmination of a lifetime of intensive study, performance and innovation. All the guitars heard on 3: Calcutta Slide-Guitar are unique instruments designed by Debashish himself, a Trinity of Guitars – Chaturangui, Gandharvi and Anandi – representing three generations of instruments, while also continuing a thousand-year tradition of music. 3: Calcutta Slide-Guitar dazzles the listener with hypnotic patterns and stunning music shaped from Debashish’s original three-finger picking technique. Born into a musical family on 12 January 1963, in Kolkata (Calcutta), India, Debashish Bhattacharya learnt to sing before he could talk. At the age of 3, he started playing the Hawaiian lap steel guitar, giving his first major concert on All India Radio at 4. The first slide guitarist to receive the President of India Award in 1984 he was made a Pandit (master) at 40. Since then he has been established as one of the world’s most outstanding slide guitarists by tours of inspirational live concerts and bestselling albums, including the breathtaking collaboration with slide guitarist Bob Brozman, Mahima (‘truly groundbreaking’ MOJO ‘beautiful and inspired’ Daily Telegraph). A designer, as well as a virtuoso, Debashish has designed nineteen slide guitars since he began experimenting in his twenties, and the three guitars heard on this album are all his individual designs. ‘Aanandam’ (‘Joy’) opens the album with Debashish performing on ‘Anandi’, a slide ukulele that he designed which produces a surprisingly direct, clear tone. Raga Tilak Kamod is an evening raga played on the fourteen-stringed Ghandarvi, whose name derives from Gandharva loka, the celestial realm of music. Composed of two parts, the second – ‘Nata Raaj’ (‘Dance Of Shiva’) – unites the traditions of Hindustani (North) and Karnatic (South) Indian tradition using a Khani rhythm pattern (swinging tintal). Chaturangui – a twenty-two-string guitar with four additional tones – completes the Guitar Trinity and is featured in Raga Basant Mukhari. In the first section, ‘Usha’, Sutapa Bhattacharya plays the background drone of the tambura whilst Debashish delicately introduces each note of the raga. In the second part, ‘Prabha’, Debashish performs with tabla accompaniment from Subhasis Bhattacharjee. The final section, ‘Maha Shakti’ (‘Beyond The Sun’) is performed at a fast tempo in tintal, a sixteen-beat cycle, displaying fantastic improvisation between the guitar and tablas. 3: Calcutta Slide-Guitar demonstrates the talents of one of the world’s most outstanding slide guitarists. On this album, Debashish Bhattacharya, an exceptional musician and design innovator, brings together a thousand-year tradition of Indian music and spirituality with his Trinity of Guitars. Reviews - By Paul Fisher. Summer 2007 has been the wettest in living memory we should have guessed that, when at the end of May it was raining all day for the BBC World Music Awards that took place on a Sunday at London's Barbican. All the other artists had been sound checked on the Saturday, except for Debashish who had been playing in Paris and had arrived on the Eurostar on the Saturday night. So, Debashish and Subashish had to be there early for a sound check and then had to run through a dress rehearsal. There was quite an air of excitement back stage. Five other winning artists would be playing; Gotan Project (Club Global) Ghadar Shbeir (Middle East / North Africa) Maurice El Medioni (Culture Crossing) and Mahmoud Ahmed (Africa). Each would have about 25 minutes or so, more than usual, to perform in front of the audience. Debashish had been selected to perform first, to set the mood, and draw people into the experience in what would be a long evening, over four hours of music. Debashish and Subhasis played three tunes, demonstrating the different guitars and Subhasis as always his amazing dexterity on the tabla. It was a magical performance and the audience was transfixed. 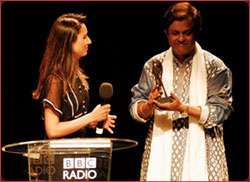 Debashish accepted his award from Anita Rani, a TV and radio personality for shows on the BBC and presenter of Cricket AM on Sky Sports. 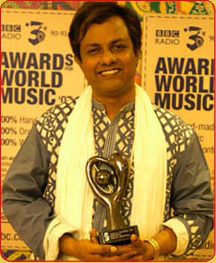 Debashish dedicated his award to all the music lovers of the world, who had given him so much love and inspiration. The feeling between artist and audience was mutual. As a boy, Debashish learned western guitar as well as sitar, but his most rigorous training was a ten-year stint during his twenties studying with Pandit Brij Bhushan Kabra, the great pioneer of Indian raga slide guitar. It was during this time that he realised his vocation would be ‘to serve as a bridge between raga’s past and future’. Now 43, and officially a Pandit (master musician) since turning 40, he is widely acknowledged as one of the world’s greatest slide guitarists, and has invented his own ‘Trinity of Guitars’. His Chaturangi has 22 strings, which enable it to suggest the timbres of violin, sitar, sarod and veena. The Ghandarvi is a 14-stinged guitar that can sound like a veena, sarangi, saz or flamenco guitar, and the tiny 4-stringed Anandi is basically a slide ukulele. He also has his own three-fingered style of playing which gives him an edge over others when it comes to speed and dexterity, and in 2003, he established a music school in his hometown of Kolkata. His notable early recordings include Guitar: Raga Ahir Bhairav (1993), Call Of The Desert (with Brij Bhushan Kabra) and Hindustani Slide Guitar (2000). He has toured and recorded with John McLauglin’s group Shakti, and in 2003, recorded the fusion project Mahima with the ubiquitous Bob Brozman, his sister Sutapa on vocals and brother Subhashis on tabla. His most recent release is the inspired 3:Calcutta Slide Guitar, which showcases the sounds of his inventions over the course of three ragas.